We stock a full range of LED lights for the living room that can be intelligently combined to create a unique living space that is bright and practical when necessary, yet highly contemporary and visually stylish when you want to relax and unwind. Whether you are looking for a cost-cutting alternative for your existing living room light fixtures and fittings, or you are planning a complete overhaul that will lift the mood and create a true sense of atmosphere and emphasize your interior design skills, Fibre Optic FX Ltd offers an extensive catalogue of energy efficient LED living room lighting ideas that will cover every base. With an impressive array of dimmable LED spotlights, bright yet subtle downlights and recessed LED ceiling lighting solutions to choose from, our maintenance free lounge ceiling light products offer unrivalled functionality and full programmability depending on your needs. In addition to our cool white and bright blue LED ceiling light options, we also stock a superb choice of full colour ceiling lights in the form of our RGB and RGBW coloured LED lights. These are easy to install and can be completely controlled using our wall mounted controller units and their handheld remotes. Our brushed aluminium, chrome and stainless steel LED wall lights will bring out the best in any interior living room design. With a diverse range of shapes, styles and sizes to choose from and an immaculate choice of finishes, this exciting product range includes everything from wall mounted, fully directional spot lights and brass effect picture lights, through to dimmable box shaped lights and circular eclipse style lights which illuminate the wall by shining light back onto it. 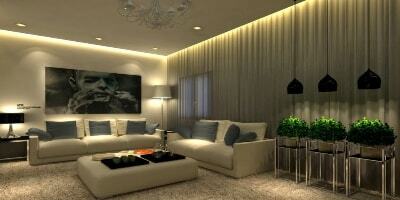 As well as traditional wall and ceiling lights, we also supply additional LED lighting ideas for the living room. These include RGB and RGBW LED tape lights, Neon effect LED tube lights, recessed wall and ceiling lights and an extensive selection of desktop and table lamps. When it comes to installing your new or replacement LED lighting system, it is important to make sure that you choose the correct power supply and driver units, particularly if you intend to use dimmer switch. If you need any help in this area, then please do not hesitate to contact us so that we can recommend the most appropriate solution for your needs.